The move to open this corridor between the two nations could break the chill in bilateral ties, which had taken a nose-dive in recent years with no bilateral talks taking place. Vice-President Venkaiah Naidu on Monday arrived in Gurdaspur to lay the foundation stone for the construction of the Kartarpur corridor which will link India’s border district of Gurdaspur with Gurdwara Darbar Sahib in Pakistan. Union Transport Minister Nitin Gadkari, Union Minister of Food Processing Harsimrat Kaur Badal, and Punjab Chief Minister Captain Amarinder Singh are also present on the occasion. To mark the 550th birth anniversary of Guru Nanak Dev next year, India last week had decided to build the Kartarpur road corridor up to the international border between India and Pakistan to let Sikh pilgrims visit the gurdwara on the banks of the river Ravi in Pakistan. The two neighbouring countries on November 15 had made an official announcement in this regard and had decided to let the pilgrims visit the holy shrine without having to secure a visa. The move to open this corridor between the two nations was the first sign of a thaw in bilateral ties, which had taken a nose-dive in recent years with no bilateral talks taking place. The ties between the two countries had been strained after the terror attacks by Pakistan-based groups in 2016. Vice-President Venkaiah Naidu will lay the foundation stone for the Kartarpur corridor today. Follow live updates here. Meanwhile, SAD protests broke out on stage after Congress leader Sunil Jakhar launched an attack on the former, saying, "The Sikhs have been in pain since 1984 and they must be healed. But some people are shedding crocodile tears. There are crocodiles who pushed Punjab into drugs. Such people will not be visible in Punjab in the coming days." Taking offence, SAD's Bikram Singh Majithia and others began shouting slogans, forcing Jakhar to leave the stage midway. "India is moving forward. The world is looking at us. Our economy is good. So, we want co-existence with our neighbours. Former PM Atal Bihari Vajpayee had said we can change our friend but not neighbours. I hope that today's step will lead us to a peaceful life. The state and Centre must work together. I am happy that his function was organised by both of them," Naidu said as he concluded his speech. "Some people are using religion to spread terrorism. But no religion has anything to do with terrorism. India never attacks any country. We don't want to attack anyone. We want good relations with neighbours. Our PM had called all our neighbours for his oath-taking ceremony. He had also visited Lahore to attend a personal function without an invite. Some people have been using religion to attack us. It is not favourable to anyone. Our main challenges are to fight illiteracy and hunger. People want peace and harmony. It is only possible if both sides are working in synchronisation," Naidu said. "Peace is the first condition of development. I hope people on the other side are also listening to what CM Singh and I have to say in this regard. The objective of this function is to work for peace." Thanking Pakistan for its co-operation in the project, Naidu said, "We are happy that Pakistan has accepted our demand. Now, we don't have to go via Attari. This corridor will be the bridge between the people of the two countries who have so much in common. The corridor will open new ways and possibilities for us." Vice-President Venkaiah Naidu, who delivered his speech after the CM, said, "The longtime dream of the Sikhs has been fulfiled. It is a historical day. We have been dreaming about this project for a long time. This will take us closer to our Guru who has worked for social and gender equality and fought caste system. We had asked the Pakistani government to recognise the sentiments of the Sikhs and develop the corridor." Continuing his attack on the Pakistan Army chief, Singh said, "It is my duty to maintain peace in Punjab. But, there are people like Bajwa who want to create disturbances. I will not allow such conspiracies. Bajwa should wake up. Only the Army runs the government in Pakistan. The Pakistan PM should control the Army and ISI. We have a bigger army than Pakistan. There is a limit of tolerance. People are telling me on Facebook to go to Pakistan. But I can't go until there is peace." CM Singh added, "Stop the attacks on Indian soil. This is why I am not going on to Pakistan despite an invitation from them. As a Sikh, I wanted to attend the Pakistan ceremony. But I am also the CM of Punjab." Hitting out at Pakistan for its attacks on Indian soil, Singh said, "I had been in the Army. I am senior to Pakistan Army Chief Qamar Javed Bajwa. Every army man knows what an army man is thinking. Who has taught that one can kill an Army man by taking them by surprise? Who taught us to attack people holding religious congregation in Rajasansi Amritsar. We Punjabis know how to give a befitting reply to such forces." CM Captain Amarinder Singh, while addressing the gathering, said, "It is a historic day for all. I thank PM Modi and Pakistan PM Imran Khan. I hope the corridor will be opened on the 550th anniversary of Guru Nanak Dev next year. Rumours are that visas will be required to visit the corridor. No visa will be required for the corridor. The Punjab government will construct a gate at the Pakistan entrance along the corridor." Taking a jibe at the previous UPA government, Union Minister Nitin Gadkari said, "We did what others couldn't do in 70 years. We will try to complete the construction of the Kartarpur Sahib corridor in four months." Addressing the crowd, SAD leader Harsimrat Kaur Badal said, "Our 70-year-old prayer has been answered. It is a historic decision by the prime minister. It is a big step towards ending animosity." Speaking on the occasion, Punjab minister S S Randhawa thanked the Imran Khan-led Pakistan government for agreeing to build the corridor. "The Pakistan government has shown a big heart. It is an opportunity to establish peace," he said. Navjot Singh Sidhu will not take part in the groundbreaking ceremony. "I went there today, offered prayers and now am flying back to MP," he said. Meanwhile, Shiromani Gurdwara Parbandhak Committee president Gobind Singh Longowal has arrived at the function. Besides Sushma Swaraj, Amarinder Singh had also declined Pakistan's invitation to attend the groundbreaking ceremony on their side on November 28, citing continued terrorist attacks in his state and killings of Indian soldiers by the neighbour's armed forces. In a letter to Pakistan Foreign Minister Makhdoom Shah Mahmood Qureshi, the CM has welcomed the historic occasion, which he described as the cherished desire of the Sikhs around the world, but said he must most reluctantly, however, regret his inability to be present. Read full story here. Under party chief Sukhbir Singh Badal's leadership, SAD will hold a procession on foot from Gurdwara Darbar Sahib Dera Baba Nanak to the foundation stone inauguration site. Punjab minister S S Randhawa said the names of CM Singh and other Punjab cabinet ministers have been covered with a black tape as a mark of protest against the names of Parkash Singh Badal and Sukhbir Singh Badal on the slab. Punjab Chief Minister Captain Amarinder Singh has landed at Dera Baba Nanak. Meanwhile, a controversy erupted over the foundation stone slab after Punjab Cabinet Minister and local Dera Baba Nanak MLA Sukhjinder Singh Randhawa objected to the names former CM Parkash Singh Badal and deputy CM Sukhbir Singh Badal on the slab. Both the Congress and the Shiromani Akali Dal (SAD) are trying to take credit over the opening of the corridor. VP Venkaiah Naidu leaves for Gurdaspur for the groundbreaking ceremony. 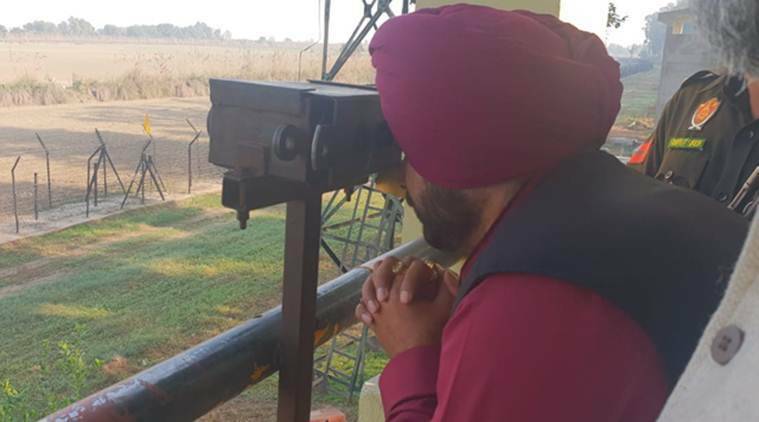 The initiative of our Prime Minister Shri @narendramodi ji for building the Kartarpur Sahib corridor will go down in history. Today is a historic day, when foundation laying of Dera Baba Nanak-Kartarpur Sahib corridor is taking place. This day will be cherished in times to come when pilgrims will regularly visit the holy shrine across the international boarder hassle free. Dera Baba Nanak Sahib & Kartarpur Sahib are twin pilgrimage places associated with Sri Guru Nanak Devji. At Kartarpur Sahib he lived preaching for 18 years and the Gurudwara Darbar Sahib is built in his commemoration. Taking to Twitter, Union Finance Minister Arun Jaitley congratulated the government on its decision to build the corridor. "Religious devotees in India will be facilitated by the foundation laying of Dera Baba Nanak-Kartarpur Sahib road corridor up to the international border with Pakistan. This corridor will provide easy access to devotees to pay obeisance at the historical and sacred shrines." Religious devotees in India will be facilitated by foundation laying of Dera Baba Nanak-Kartarpur Sahib road corridor up to international border with Pakistan. This corridor will provide easy access to devotees to pay obeisance at the historical and sacred shrines. The Pakistan side will lay the foundation stone of the corridor November 8. While Pakistan had extended an invited Ministry of External Affairs Sushma Swaraj, she refused them due to "prior commitments. Instead, she nominated her Cabinet college Harsimrat Kaur Badal and Hardeep Singh Puri, to attend the ceremony as the Indian government’s representatives. Read full story here. On Sunday during his Mann ki Baat programme, Prime Minister Narendra Modi had said, "The government has made a very important decision - that of opening the Kartarpur Corridor so that people of our nation can easily go to Kartarpur in Pakistan and visit the sacred place of Guru Nanak Dev." The move to open this corridor between the two nations is the first sign of a thaw in bilateral ties, which had taken a nose-dive in recent years with no bilateral talks taking place. The ties between the two countries had been strained after the terror attacks by Pakistan-based groups in 2016. Besides this, the corridor will be a historical landmark between the two countries and will also boost tourism as more pilgrims would visit the holy shrine throughout the year between two countries, the statement by the road ministry said. The Indian side of the corridor starts from Dera Baba Nanak in Gurdaspur district and extends up to the international border between India and Pakistan. The project corridor is to be developed by the National Highways Authority of India and will be funded by the Government of India. The project corridor is four-lane with service road and all other appropriate amenities for pilgrims intending to visit Gurudwara Darbar Sahib, Kartarpur in Pakistan. To mark the 550th birth anniversary of Guru Nanak Dev next year, India last week had decided to build the Kartarpur road corridor up to the international border between India and Pakistan to let Sikh pilgrims visit the gurudwara on the banks of the river Ravi in Pakistan. The two neighbouring countries on November 15 had made an official announcement in this regard and had decided to let the pilgrims visit the holy shrine without having to secure a visa. India today will lay the foundation stone for the construction of the Kartarpur corridor which will link India’s border district of Gurdaspur with Gurudwara Darbar Sahib in Pakistan. The inauguration at Gurdaspur will be done by Vice President Venkaiah Naidu in the presence of Union Transport Minister Nitin Gadkari, Union Minister of Food Processing Harsimrat Kaur Badal and Punjab Chief Minister Captain Amarinder Singh. The Indian side of corridor starts from Dera Baba Nanak in Gurdaspur district and extends up to the international border between India and Pakistan. The project corridor is to be developed by the National Highways Authority of India and will be funded by the Government of India. The project includes a four-lane corridor with a service road and all other appropriate amenities for pilgrims intending to visit Gurudwara Darbar Sahib, Kartarpur in Pakistan. This corridor will be a historical landmark between India and Pakistan and will also boost tourism as more pilgrims would visit the holy shrine throughout the year between two countries, an official statement said.